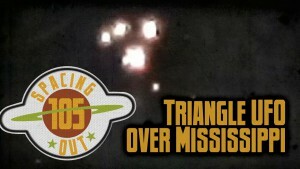 A woman in Mississippi recorded video of a large triangle-shaped UFO. We discuss this and other space and UFO stories on this episode of Spacing Out! Jason McClellan also talks with Jessica Chobot, host of Nerdist News and of the Bizarre States podcast. Plus, we show you a brief glimpse of the 2015 International UFO Congress. **Special thanks to Jessica Chobot for taking the time to speak with us, especially since she was sick and on lots of cold medicine!